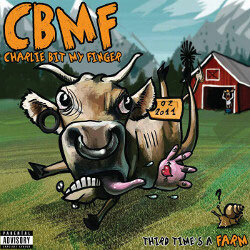 A new record and two new labels for Belgian punk rockers Charlie Bit my finger. The five-piece is known for their melodic riffs, straight-forward drums and clean vocals, which they have now combined to a 12-track full album that goes by the name of Third Time’s A Farm. Third Time’s A Farm will be out on Bearded Punk Records (BE) in CD and digital format and will be co-released by Canadian label Thousand Islands Records on September 16th, 2017.